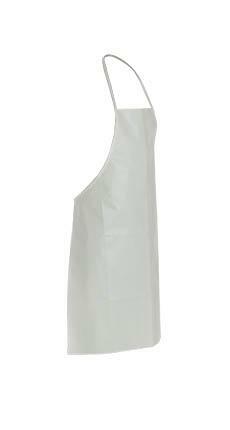 Apron, bib style, made of Tyvek material with bound seams, neck loop and waist ties. Universal in Size. DuPont™ Tyvek® Bib Apron. 28" x 36". Neck Loop & Waist Ties. Bound Seams. White. Tyvek® is a unique, nonwoven material comprised of heat and pressure bonded polyethylene filaments. Resistant to penetration, Tyvek is a highly effective contamination control fabric. It is chemically and biologically inert, low linting and static-free until it is laundered. Tyvek® provides an ideal balance of protection, durability and comfort of any limited use fabric technology. Tyvek® fabric offers an inherent barrier to particles down to 1 micron in size. Protection is built into the fabric itself; there are no films or laminates to abrade or wear away. Tyvek® fabric's durability advantage over microporous film and SMS fabrics delivers consistently better barrier, even after wear and abrasion. Applications include: lead and asbestos abatement/remedation, general maintenance/operations, spray painting, and general clean-up. The garment shall be constructed of DuPont™ Tyvek® -- a patented flash-spun polyethylene fabric. The garment shall be white in color. The garment shall be a bib apron design. The garment shall have bound seams. The garment shall have a neck loop. The garment shall have waist ties. The garment shall be 36" in length. Wear other appropriate PPE such as, but not limited to, respiratory, eye, head, hand, and foot protection based on the hazard assessment. This garment only provides partial body coverage. It may be worn in combination with other chemical resistant PPE as required based on the hazard assessment.